If you decided to stroll around Victoria Park return to the towpath and then turn left and pass Old Ford lock (1), and the old lock keeper's cottage and outbuildings. Originally there were stables here and also a pumping station that facilitated water on the lower pound to be pumped back to the upper one. After passing under Old Ford Road bridge, the towpath begins to rise for it has to cross the entrance to the Hertford Union Canal. This was constructed as a link to the River Lee Navigation and was also known as Duckett's Canal after Sir George Duckett, who built it. A new development adjacent to the junction was recently completed. Photo 2 shows how things were and 3 how they are now. The boat about to pass under the bridge is the Jena, owned by the Canal and River Trust. From here right down to Limehouse you will find yourself with plenty of open space to your left, which is the result of the adoption, over the past half century or so, of the principles of a visionary 'green space' plan produced in the Second World War, which was greatly influenced by Sir Patrick Abercrombie. During the war a considerable amount of open space was created by bombing attacks, much of it in the East End, which created opportunity as well as devastation. Abercrombie was not the first person to suggest how the need for open spaces in London could be met. Nine years after the opening of the Regents Canal a visionary landscape planner named John Loudon, suggested, in an article entitled ‘Hints for Breathing Places for the Metropolis, and for Country Towns and Villages, on fixed Principles’, that the centre of London should be surrounded by concentric rings of 'country' interspersed with rings of 'town'. As Regents Park, Islington and Bethnal Green would have been in the country and Loudon suggested that the rings should be varied according to local circumstances it might well have been that, had the plan been carried through, the Regents Canal would have been maintained as a 'country' canal in perpetuity. Instead its banks became almost wholly industrialised and commercialised. I suppose now we can say now that they are well on their way to being residentialised. Recently the canal side area between Mile End and Limehouse was awarded the Green Flag for the quality of the green space, something to which a number of organisations have contributed. I think Loudon would have approved. After passing under Twig Folly Bridge (which actually carries Roman Road) you will see an unusual signpost, which indicates that you are now in an Ecology Park (5). 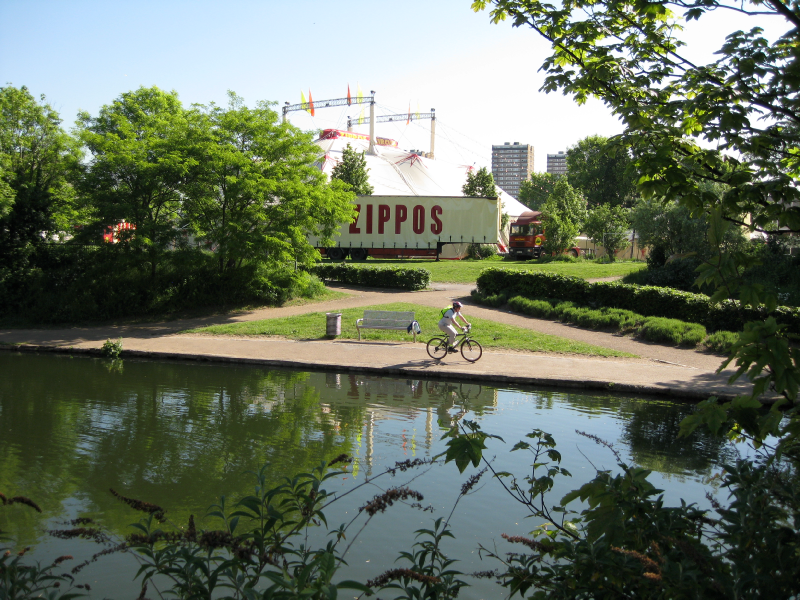 You have the opportunity to walk through this as you continue towards Mile End as the park path, although it meanders a little bit, will bring you back to the towpath. As you cross a wooden bridge you will, perhaps, hear the whirring of the windmill before arriving at the palm trees which stand by the side of the Palm Tree pub (6). After rejoining the towpath you will pass under a new footbridge and, close by, see three pieces of public artwork. One represents a barge horse (7), one Sylvia Pankhurst, the Suffragette leader who worked in Mile End during the First World War helping the poor, and the other Ledley King, the Tottenham and England player who grew up locally. The artwork was erected by Sustrans, a cycle charity. The entrance to the Mile End Climbing Wall is to the left and there is a railway bridge ahead. The railway crosses Grove Road a couple of hundred yards away where a plaque indicates the first V1 flying bomb landed in London in 1944. Three years earlier the East End had been subjected to the Blitz and unexploded bombs from that air offensive are still turning up, a large one being found close to the canal in May 2007. There was great apprehension of the effects of bombing on London prior to the war and huge numbers of metal stretchers were produced to carry casualties. When the war was over these were usually scrapped, but a few are still dotted about, put to other uses. The one in photograph 8 is in Hackney, a few hundred yards south of the Cat and Mutton bridge. It serves as a climbing frame for plants. Passing under the railway bridge will take us close to the Queen Mary campus of London University and to Mile End locks and Mile End bridge. The old lock keeper's cottage at Mile End lock is now used by the university and a meeting room was been built on the side a few years ago (9). It is, perhaps, not an addition that will meet with the full approval of all those interested in canal architecture. On the towpath side of the canal there is what looks like an Iron Age barrow. It is not, but there are seats on the top where you can rest after the climb (10) and look over the surrounding area. Signboards give a little information about the pleasure gardens created here after the canal was built. The entrance was by the New Globe tavern, which stood (and still stands) on the Mile End Road. If you walk to the front of the tavern and look closely at the facade you will see a plaque bearing the date 1820, so this may be one of the very first buildings to have been built with bricks transported along the canal. As at Camden today some of the first barges going through the Mile End locks were probably observed by those enjoying their leisure hours. Rather than continue along the towpath why not take a walk over the Green Bridge? There are two paths over this, one for pedestrians, one for cyclists. Right on the top you will be able to look down at traffic going and coming from ‘town’. You will also be able to see the New Globe, which, from the outside, appears not too different to that of the early C19th. Just before the 2012 Olympic Games began the Olympic torch was carried over Mile End Bridge by the Jan Mela (11). At the age of 13 Mela was severely injured as a result of a taking a 15,000 volt electric shock when sheltering from the rain in a building housing an electrical transformer. However, despite then becoming a double amputee he showed incredible resilience and set out on expeditions to both the North and South poles. He reached the first when he was fifteen and the second the day after his sixteenth birthday. A remarkable man. Rumour has it that the International Olympic Committee decided to opt for London above all other cities as the venue for the 30th Olympiad of the Modern Era because they knew a huge amount of razzmatazz would be generated by the Regents Canal bi-centennial celebrations (including, of course, publication of When London Became An Island). Evidently the committee members hoped some of this would rub off on their games and, although that assertion is only hearsay, it is certainly true the opening ceremony featured the change from a pastoral to an industrial society and that Mr Boyle, the director, lived in Mile End. 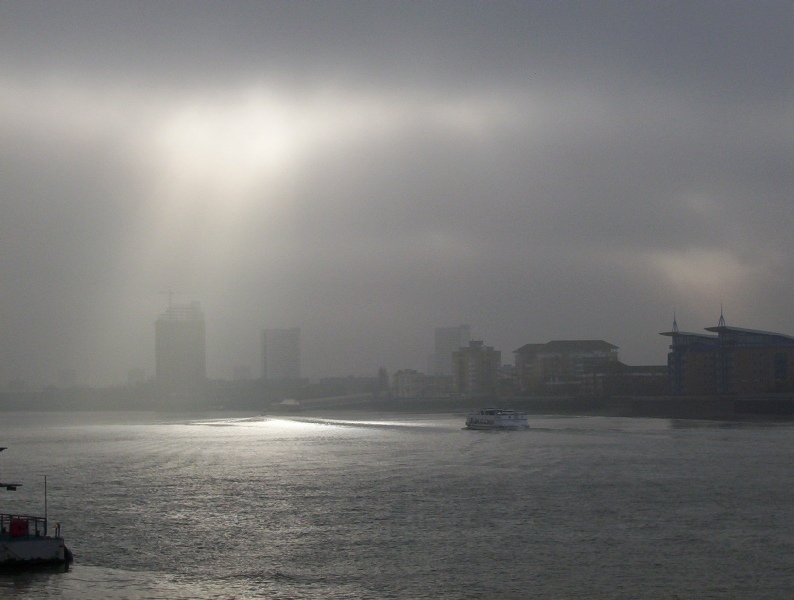 Peter Ackroyd, author of many works about London, once asked if it was possible that within this city and within its culture are patterns of sensibility or patterns of response which have persisted from the thirteenth and fourteenth centuries and perhaps even beyond? so who knows what unidentified influences helped shape the creative process. As in Hackney Road, the area around Mile End locks was built up soon after the arrival of the canal. Many of the bricks were evidently imported from Kent, particularly brickworks on the River Medway. On Mile End Road, a short distance from the Green Bridge, I took photograph 12 of the corner of one of the remaining terraces. A little further along the block, signs in windows indicated concerns about Crossrail, the new rail line linking east and west London and beyond. Crossrail runs through a tunnel under the East End. I wonder if any houses above the tunnel suffered from subsidence and, if so, if the owners got the kind of immediate attention Morgan gave to the residents of Islington when the Regents Canal tunnel was built? Crossrail has been be an expensive project, as was the construction of the 2012 Olympic site. In 1816, when the shareholders of the Regents Canal faced the fact that the initial cost projections of the project had been far too low, they were told that the extra money required for completion would be less in proportion than has occurred in almost every instance of great works of the same nature. The London Docks, Liverpool Docks, Bristol Docks and Strand Bridges were cited as examples. Cost overruns are nothing new and it is doubtful they will be eliminated any time soon. Continuing over the Green Bridge to return to the canal you are sure to notice the park lamps with their electricity generating windmills and solar panels. All part of the park's sustainable design. After re-joining the towpath you will soon come to Johnson's lock. On this particular stretch of the canal there always seem to be plenty of birds, mostly moorhens and Canada geese (13), but swans may be seen occasionally and a heron too. I have also observed, but admittedly only rarely, kingfishers. Close by the lock you may see a sign (14) erected by the Lower Regents Coalition, a voluntary group which, as it says on the poster, cares for the canal between Mile End Road and Limehouse Basin. From here on you will notice a number of such notices all of which mark an improvement to the banks beside the towpath. A short distance after the lock you will come to the Ragged School Museum (15). It is a very popular attraction where old fashioned lessons are given to new fashioned children. They go down a storm and I am sure Dr Barnardo would have approved. The museum is open to the general public and access to the museum cafe is from the towpath. The cafe is open Wednesday and Thursday from 10 to 5 and on the first Sunday of each month from 2 to 5. Looking across the canal at this point you will see a relatively new housing estate but for most of the past two hundred years the view would have been dominated by the Stepney gas works. This was established in the early Victorian period and parts remained active until the early part of this century. When the final site clearance took place the ‘rotten eggs’ smell, such constant feature of old gas works, was noticeable from the towpath. All gone now. Nothing like the development which has taken place in Kings Cross is evident here, but if you leave the towpath by the steps and walk over Ben Jonson Road Bridge you will see the remaining cast iron wall plates, which were used to secure wrought iron bars that ran across the gas works coal store. Boats would unload coal from the canal into the store and such was the pressure on the brickwork that the bars and plates were fitted to stop the walls bulging (16).Turn right at the end of the wall and you will see two information boards by the side of the canal. These give information about the gas works and near the end of a winding path that leads off through the estate you will find two more. These stand by four column bases that mark the point where one of the gasholders once stood (17). Returning to the towpath and passing under the bridge will take you by the side of a small open area from which you will get a good view of the towers of Canary Wharf. There are mooring posts here, one of which used to be painted with an exhortation (18). To be honest I never knew Soul and Punx were divided - did you? The call for unity has now been painted over, sadly, but I hope Soul or Punk will return to renovate it soon. Although they both will probably be pushing middle age by now, it would still be better if they could make up their differences. The canal now swerves to the right, dictating the curve of a row of newish terrace houses. The tall chimney hard by the towpath was built to serve one of the tunnels that fed into Joseph Bazalgette's Northern Outfall Sewer, constructed to carry London sewage away to the east. The canal is a little wider at this point and this seems to encourage the growth of various types of plants (19). At certain times of the year tangential light from the afternoon sun may illuminate the under water world where shoals of small fish nibble away at banks and strands of submerged green weed that respond gently to the slow current or the displacement of a passing hull. Ghostly scraps of metal trash might also be seen (20). Once shiny and new and a pride and joy, these junked items now rest on the canal bed. Casually discarded, forlorn and forgotten. Just a pity the owner couldn’t be bothered to put them in the recycle bin. Beyond a railway bridge that always seems to be busy with passing trains are another set of locks, which take their name from a nearby street. At Salmon Lane lock I spotted the feathers of the Prince of Wales (21), much like those painted on the gondola of Mr Saddler's balloon when he drifted over this area in 1811. 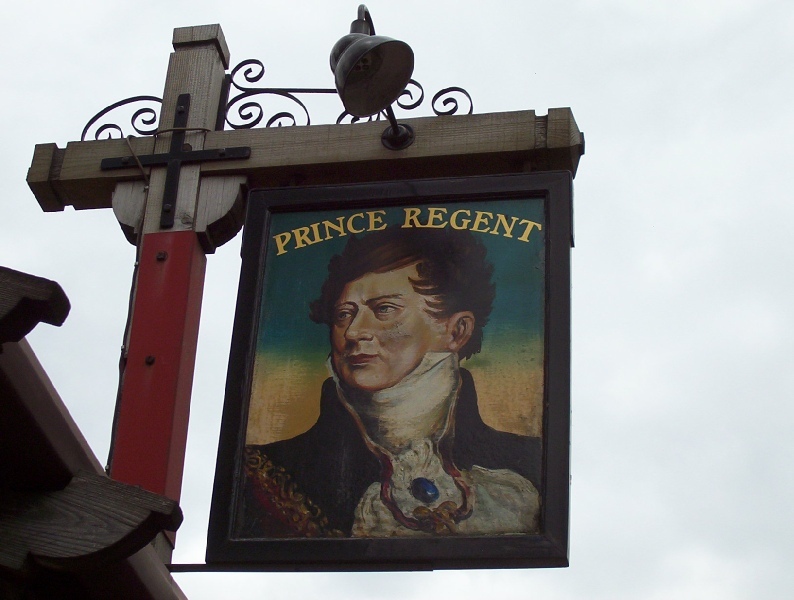 On Salmon Lane itself, close by the bridge, there was, for many years, a pub called the Prince Regent (22). The pub sign has gone now but I do hope that generations of patrons raised a glass every August 12th to his memory. Someone should also raise a glass to those volunteers who help with canal clean-ups. Thames 21 have played a part in this vicinity as have the Canal and River Trust and Moo Canoes too. After passing under the footbridge and then Salmon Road Bridge a large oblong box, on the far side of the canal, soon becomes visible (23). At first glance the box may seem just to be randomly camouflaged in an abstract way in bright colours, but look closely and you will see the wrap-around mural represents aspects of bird life. This is fitting as the structure, which is a super size nesting box, was built in order to encourage kingfishers that over-winter in the locality to remain through the spring and summer. Construction was supported by Tower Hamlets Council and the Friends of Tower Hamlets Cemetery Park and actually built by volunteers from Grounded Ecotherapy of Providence Row Housing Association. The painting was done a few months ago by an artist, Chris Hylton, who was supported by Trapped in Zone One and the Lower Regents Coalition. Let’s hope all this hard work pays dividends. Click on photo 24 for more details about the nest bank. The next point of note is the unusual twin arched bridge carrying Commercial Road (25). Commercial Road was an important link between the new docks, which were established at the turn of the C19th, and the City. When the first railway link was built it followed much the same route and the viaduct which carried it may be seen just beyond the last lock on the canal. Today, the viaduct carries the Docklands Light Railway (26) and it is rather ironic that trains on this system have no drivers. The civil engineer who designed the original railway was Robert Stephenson and he decided that fitting steam engines at either end of the track would be a better option than using conventional locomotives - so there were no drivers on his trains either. When services began in 1840, passengers boarded at either the Minories or Blackwall or one of the intermediate stations and the carriages were hauled to their destination by a long rope. A couple of years ago a biography of Sir John Bowring, by Philip Bowring, was published by the Hong Kong University Press. The title ‘Free Trade’s First Missionary’ is apt and the book has a photograph of the Regents Canal at the point where it is crossed by the viaduct - Bowring became chairman of the company that operated the railway in 1845. More on Bowring in ‘Soochong, Shogun and the Saracen’s surveys’. Once under the viaduct we arrive at Limehouse Basin. No longer a freshly dug basin awaiting its first collier nor a busy commercial dock handling goods from every corner of the earth it now gives service as a C21st leisure marina. Walk over the footbridge immediately ahead and carry on by the side of Stephenson’s viaduct. You might be concerned to see a danger sign (27) but look closely and you will see it is a warning about your happiness levels! I hope, if you feel that way, it is as a result of having completed your walk all the way from Paddington. If you want to leave the walk here go straight ahead. You will soon come to Limehouse station on the Docklands Light Railway. Alternatively, turn left at the corner of the dock and follow the dockside to Narrow Street where a lock allows boats access to the Thames (28). Turn left on Narrow Street and walk along to a little triangle where you will see a giant bird and the 'Grapes' and 'Booty's' and then turn right onto the Thames Path. The entrance is through an 'arch' a little beyond the little park called Ropemakers Fields, which is on the left-hand side of the road. If you follow the Thames Path path you will get good views of the river (29) and will eventually come to Canary Wharf, a modern centre of commerce built on the site of the old West India Docks. Some of the old warehouses remain and here you will find the Museum of London Docklands. Now the Rio Olympics are fading into the history of sport. They were a great success and I’m sure Limpic enjoyed every minute. No doubt many residents of Rio were as sad to him go as those of London were. But on to Tokyo! The Museum of London Docklands is well worth a visit as it gives an excellent overview of the development and operation of the old docks over the best part of two centuries. There is a coffee shop there too so if the last cup you tasted was at the Watermile (and that will probably seem like an age ago) why not treat yourself and forget about the hand that set free the world for half an hour. Alternatively, close to the museum is a Wetherspoons pub housed in the old Ledger Building, which, long before the invention of the filing cabinet, let alone the computer, was the administrative heart of the docks. The interior still seems to retain something of the atmosphere of the C19th. It is almost two hundred years since the Regents Canal was constructed, which probably seems in the dim and distant past. But consider this. In the 1980s a Bethnal Green neighbour of mine, who was then in her 90s, told me a number of stories about her childhood and adolescence. Of soldiers returning from the war (the Boer War), of nearly being sacked for taking time off for watching an exciting event (the Siege of Sydney Street) and of going off to London on the number 8 bus (horse drawn and open topped). She was born in 1894. When she was a girl there would have been people in the East End who could have remembered, as clearly, the opening of the Regents Canal in their own childhood. So it is not so long ago really is it?